Thanks for the support everyone! So here we go… It’s crawfish season, but starting a bit slowly this year. So we want to make a crawfish dish around mid-March. We’ll leave voting open until March 14th. posted by jessica	at 04:48 PM	Filed under Reader's Choice. You can follow any responses to this entry through the RSS 2.0 feed. Both comments and pings are currently closed. Yay! This is like being on a game show! c’mon people, VOTE FOR ETOUFFE!!!! What is wrong with you???? i have NEVER had crawfish. what does it taste like? 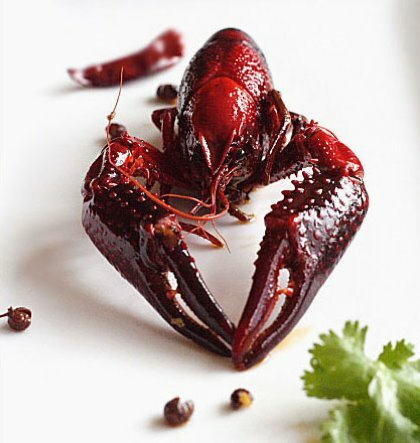 Pearl – Crawfish look like tiny lobster and to some extent, taste like them. The flavor is different, perhaps a touch more gamey. But the main difference is the texture. Crawfish are a much denser meat and have a really nice snap when you eat them. When I was a kid my parents would take me to a seafood place called “The Barge”, which ironically, eventually sank (literally). They had an amazing dish, served in a cauldron, that had crayfish in them. Crayfish are (AFAIK) the same as crawfish, and are called differently just based on geography (like ‘soda’ vs. ‘pop’). However, some folks also call them differently based on their size. Larger critters are the crayfish and the smaller guys are crawfish. Yum! I love crawfish etouffee! SERIOUSLY ETOUFFE!!! What the heck peoples?! lol. Wow| That’s very very great job! !I will certainly try to do this as soon as possible..